Case studies are posted regularly and the moderators response follows a few days after a case is posted. Please feel free to post your ideas we may find you have a better answer than the moderator! Return to list of case studies. 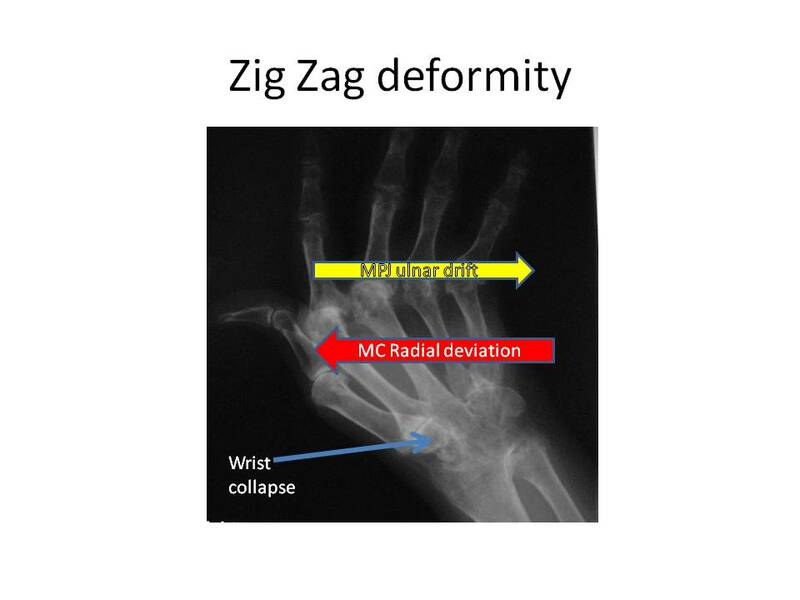 Zigzag deformity seen in RA. The wrist will deviate to the radial side while the MPJs deviate to the ulnar side. Check out our wonderful ARTHRITIS UNLOADED: RA and OA courses to solidify your understanding of the two pathologies. Anonymous Ulnar drift; Most likely due to RA as you an see the boutonniere deformity of the thumb as well. Anonymous Ulnar drift of MPs from RA - carpus actually deviates radially.